Saturday night we were at a friend's house for dinner - BIG dinner, ate and drank way too much, didn't think I could drink that much wine and not get drunk. Anyway, after dinner we moved to the living room for Turkish coffee and to smoke the hookah (shisha). I've got to tell you that I've seen these before, but I didn't have a clue as to how you're supposed to smoke them. It was truly a learning experience. We were smoking an apple type of tobacco, which was exceptionally smooth and the aroma was quite pleasing. My biggest problem at first was that I was trying to smoke it like a cigar, where you basically inhale the smoke just into your mouth. I noticed that everyone else was getting these big plumes of smoke when they exhaled and for me there was hardly anything. Hmmm? How did they do that? Well, they're smoking it like a cigarette - yes, they're taking a big draw into their lungs. I tried it - oh yeah, I'm smoking like a chimney now. Hah! 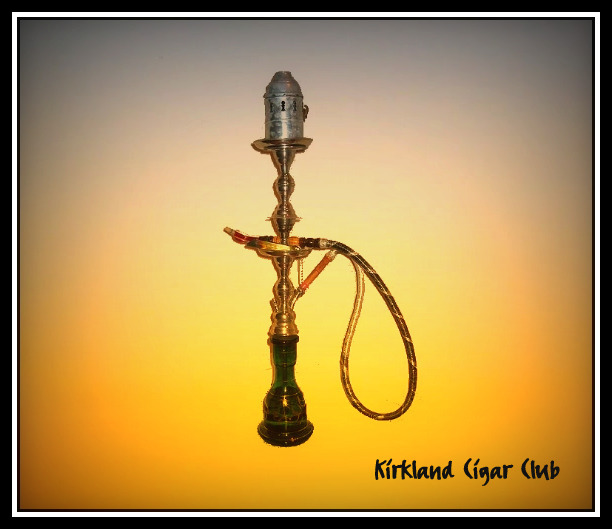 The water in the base of the hookah cools the smoke down and mellows it out, so even though the smoke is going deep into your lungs, you don't feel like coughing it all out. Would I do it again? Of course! I enjoyed it. I don't see myself going out and buying one of these, but if the occasion arises again some day, I definitely would not turn it down. So on Friday night while I was down at the Tobacco Patch, I was searching for a cigar that a friend of mine (Leif) recommended. His taste being similar to mine, I thought I'd see if I could find it. Well, unfortunately I couldn't find the Acid Kuba Kuba, but I did find an Acid Blondie, so I picked that up along with a Baccarat cigar. 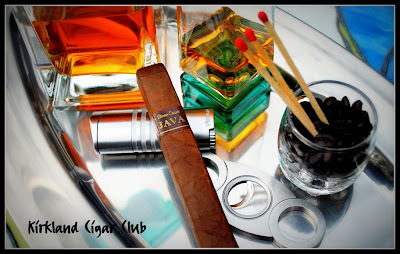 First the Baccarat, which I smoked on Friday night -Terrible cigar, too harsh and an awful flavor to it. This was probably one of the worst cigars I've smoked in years - harsh and it left a terrible taste in my mouth afterward. I need to go and brush my teeth just thinking about it! Saturday afternoon was beautiful, temperature around 60º and sunny blue sky. 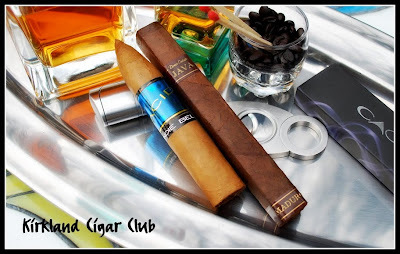 I was over at the Redmond Town Center Mall with my lovely wife, she was shopping and of course I was at the cigar store trying to find an Acid Kuba Kuba cigar. Naturally they didn't have it, but they did have a few Drew Estate selections, one being the Java. Oh brother this is a good looking cigar, but more on that later. I bought the Drew Estate Java and a Perdomo cigar. 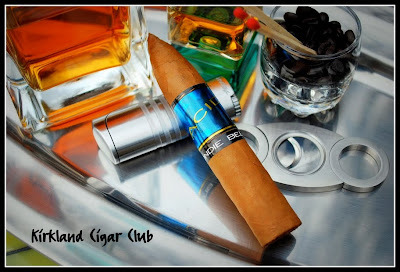 Anyway, Saturday night we buzzed up to the Snoqualmie Casino to meet up with friends at the Lit Lounge (cigar bar). We got there a little early, so we started out at the poker slots at the bar, my favorite slots by the way, played for about an hour or so, then headed over to the Lit lounge. I lit up the Java Maduro - Oooooh, that's nice. The slight sweetness on your lips and the medium bodied, very smooth taste was such a pleasant surprise that I had to let my wife try it. She puffed on it and gave me a look like "wow, that' IS good!" Two thumbs up so far. I couldn't really say if I tasted coffee or cocoa flavor, I just know that it was a very unique taste and I liked it! This cigar continued to impress me the entire time. The sweetness diminishes as you get towards the end, but overall it's an excellent cigar. Since it was still early and we were deep in conversation with the gang, I decided that this would be a two cigar evening, and I just happened to bring a second cigar with me. I've seen the Acid label before, but never thought too much of it. I think anything that says "acid" on the label has a negative impact with me. Well, it looks like I was wrong. I liked it! 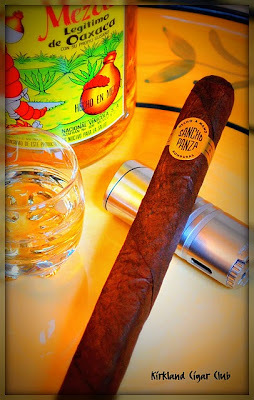 This was a very mild cigar, extremely smooth, flavored cigar, excuse me, flavor infused cigar. The only small issue is that it might have been a little too sweet at first. But, since I was drinking a cup of French press coffee, which is already pretty darn strong, the two taste seemed to balance out one another. This is a good cigar if you didn't have much time - the cigar is pretty short and it seemed like I smoked this in about 20 minutes or so - really fast. Overall, I liked it though, but I would definitely buy the Java over this one. Perfect evening for a walk last night, so I ventured downtown to see if anything was happening in Kirkland for St.Patrick's Day. It was still a bit early, 8:30 PM, so I didn't expect much. "Holy Crap! Where did all these people come from!!??" What's interesting is that St.Patrick's Day has a bigger turn out than New Year's Eve. Why is that? Friday night at the Tobacco Patch - great turnout and perfect weather. Saturday night dinner party at my house - way too much booze. 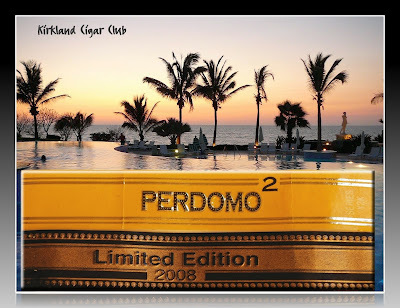 Great cigars. If I had to choose between an Oliva and a Da Vinci, I'd still choose the Oliva, but these are pretty good smokes, very reliable, and the price I paid for them was equally incredible, so I'm pretty pleased all around. Nice job Da Vinci! Stopped by Rain City Cigars in Georgetown yesterday and asked them what's up with the cigar tax legislation that's being debated right now? What started out as an increase of $3 per stick is now down to around .16 cents, but that's subject to change. We may know by the end of next week what the final increase will be. Politicians aren't dumb you know, they start WAY high on the tax increase knowing full well that they're going to get something, just not everything. "The only way we are going to be able to realistically reduce our health care expenditures is by addressing the two most prevalent causes of exorbitant health care costs - smoking and obesity. In Washington State alone we spend over $2 billion on health care expenses that are directly associated with smoking. State government alone spends over $651 million in taxpayer dollars each and every year on Medicaid services covering the cost of smoking related illnesses. The great news in Washington State and King County specifically, has been the massive reductions in the numbers of smokers who have quit due to policies we've pursued over the last seven years. The last increase in cigarette taxes coupled with the prohibition on indoor smoking has greatly reduced the number of smokers and smoking related health care expenditures in our state. We have gone from over 20 percent of our citizens smoking to near 15 percent. In King County, we've seen an even more dramatic drop from 18.5 percent in 2000 to the current estimate of just under 11 percent. Smoking is very price sensitive, especially among our teenage children, and this $1 increase will help prevent over 74,000 children from taking up this unhealthy activity that has shortened so many lives. I think all of us can agree that having 74,000 young children not taking up this habit is a good thing." What pissed me off even more was the fact that he made no mention of cutting government spending. Anyway, we'll see what happens. The real problem isn't necessarily the tax, it's the fact that the Washington cigar retailers won't be able to compete with out of state and/or internet retailers. Right now it's a matter of convenience for me, but if the tax goes up too much, I'll have to look elsewhere. You know how they say that you should never judge a book by it's cover, well technically speaking you can apply that same law to cigars. 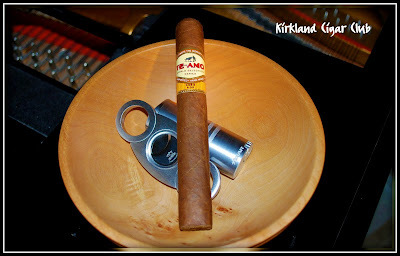 I had high hopes for this Te Amo Cuban blend when I picked it up at the smoke shop last week. 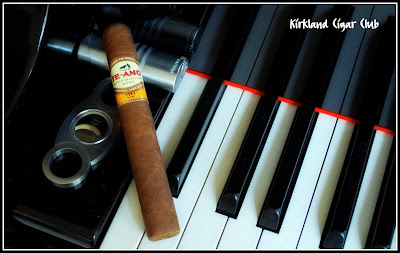 It looked like something I would enjoy - wrapper has a nice color, nice big robusto ring size, price was good, and an interesting wording on the label: Te Amo and Cuban Blend - what's not to love? OK, so here's what I didn't like. First, the draw. I really had to work this cigar to get anything out of it. It's not that it was wrapped too tight, actually it had the perfect feel to it, but for some odd reason I just couldn't get the amount of smoke that I was looking for. Secondly, the taste. Since I was already hacked off at the draw, it was easy to complain about the taste. It wasn't necessarily strong or harsh, but I think this particular leaf is not my cup of tea. I'll smoke it, but it's really not my favorite. So on Sunday afternoon while my lovely wife was at the Mall and I was pretty much caught up with everything, I decided to take a break and have a cigar. 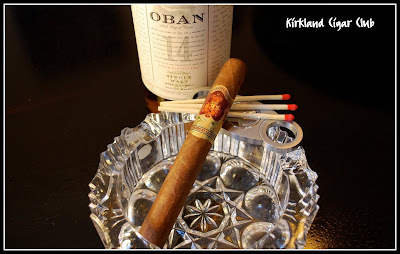 I poured a glass of Oban, grabbed a cutter and some matches and picked out the first cigar that I saw in my humidor. Meh... nothing special. (I think the label was telling me something after all) The draw was good, it burned well, the taste was acceptable and it was somewhat smooth, maybe a hair on the strong side, but the one thing that it wasn't was memorable, at least not to me. Don't get me wrong me, it's really not a bad smoke, just not one that I would go out of my way to buy. Had this been just a bit more creamy or silky so to speak, it would have made it to the "Good" category. Oh well... An average cigar is better than a bad cigar.